Is there a way to automatically schedule when to disable a form? I use Jotform heavily for event registrations and most of my events have a registration deadline - I would love to be able to setup an auto form disable, where i could setup a date and time the form disables itself and shows a "form closed" page like the thank you page after submission. 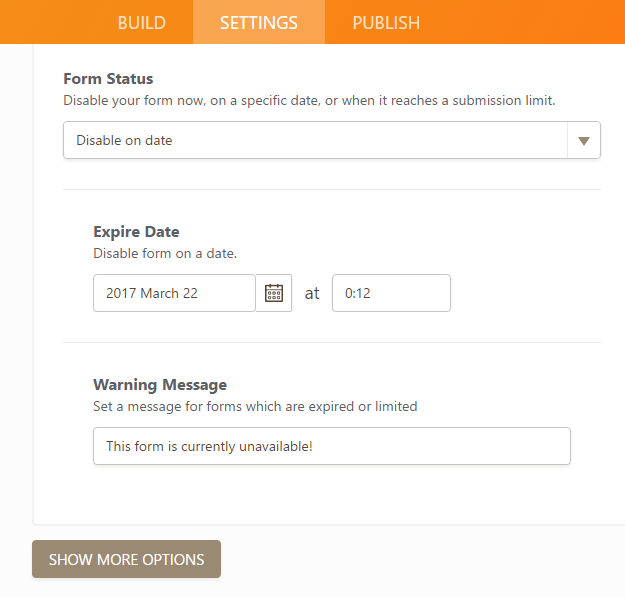 Also, if there was a Form deadline countdown widget that we could add to the Form that would be awesome! I think it could improve our form submission rates because people would see a countdown timer of how long they have before they have to fill out the registration/form. I know for a fact that people will click on my link to register on Jotform but they will close out the window and do it later. If the form showed they only had 2 days left or "x" amount of hours left they have before the form/registration closes it would get them to fill out the form immediately. I would love to be able to setup an auto form disable, where i could setup a date and time the form disables itself and shows a "form closed"
You can do this using the Submission Limit base on date feature of the form.